One hour of yoga with Funky Buddha, a group bike ride led by The Spoke Folks, and brunch & bourbon at One Bourbon, all to benefit The Spoke Folks. They will be June 10, July 8, August 12, and September 9, 2018. 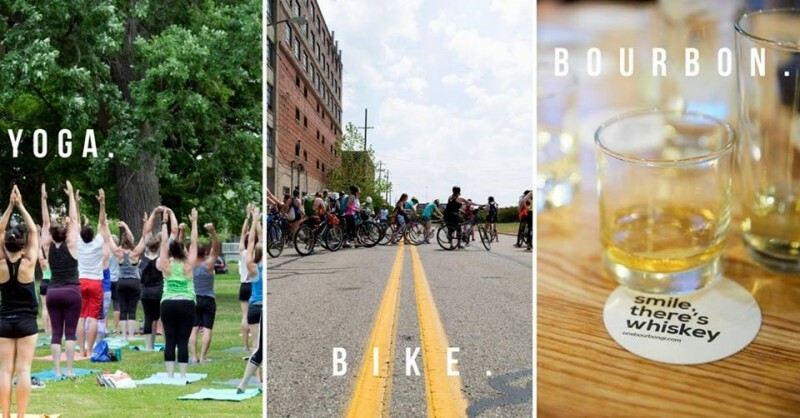 One hour of yoga with Funky Buddha, a group bike ride led by The Spoke Folks, and brunch & bourbon at One Bourbon! All to benefit The Spoke Folks. The Funky Buddha Yoga Bikes Bourbon Triathlon series is back for its third year. Dates for the 2018 Funky Buddha Triathlons are June 10, July 8, August 12, and September 9. They begin with yoga at Lincoln Park at 10 a.m., followed by a 10 mile bike ride ride through the West Side of Grand Rapids, and culminate with a celebration at One Bourbon. For those wanting to participate but don’t have a bike, The Spoke Folks will be renting them out for $20. Tickets are $49 per ride or $160 for the whole series, and in addition to yoga and a guided bike ride, they include a T-shirt, and a brunch entree at One Bourbon. Those signing up for the full series will be in the running to win a customized bike from The Spoke Folks at a $1000 value, one year of unlimited yoga at Funky Buddha, or free fried chicken for one year at One Bourbon. Now in its third year, it’s something the staff of Funky Buddha and The Spoke Folks look forward to every year. 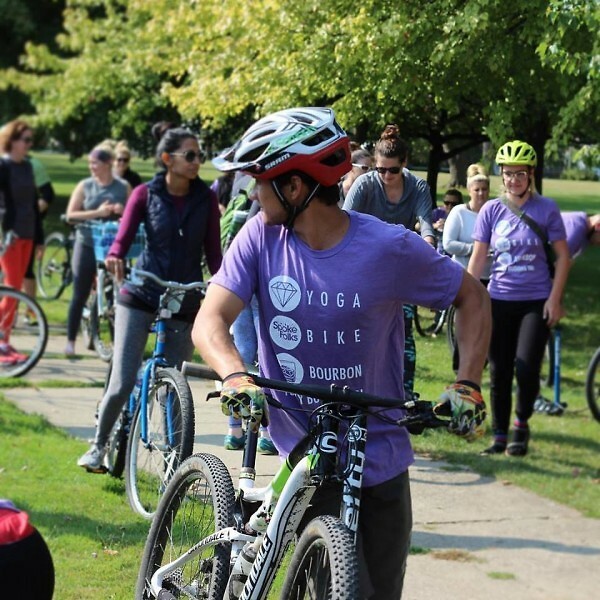 The Spoke Folks has been a non profit partner from the beginning, through the yoga studio’s Community Program, a branch of The Funky Buddha that is specifically focused on investing in the greater Grand Rapids community and the work of the local non-profits. The Spoke Folks’ mission is to increase and sustain bicycle ridership in Grand Rapids through affordable bicycles, bicycle mechanic services and educational support. 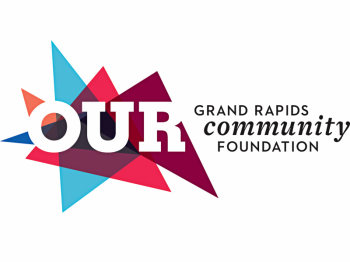 The organization works to ensure that anyone wanting to ride a bicycle in Grand Rapids will have one that is safe and will feel empowered to ride. A large component of The Spoke Folks’ work is to help ensure that everyone in the community has access to a reliable bicycle, including those with limited financial means. Because they sell bikes at such a reduced rate, it is imperative to have strong community support from both individuals and business partners, Posey said. For anyone thinking a 10-mile bike ride might be too lofty of a goal for them, Posey said it’s mind over matter. “All you can do is try to prove yourself wrong,” he said. The Spoke Folks will be supporting riders the whole way and there is a no drop rule, meaning if a rider is not able to stay with the group, there will be a Spoke Folks staff member or volunteer who will ride with them. Find more information about Funky Buddha and the Yoga Bikes Bourbon Triathlons here. Learn more about The Spoke Folks and how to support their work here and by following them on Facebook.